Natural gas tankless water heaters are popular among homeowners because they provide unlimited hot water without the high energy bills a conventional water heater produces. Rather than maintaining the water temperature within a storage tank, tankless water heaters only heat the water when it’s needed. That’s an instant decrease in energy use, even when there is a high demand for hot water. What’s more, homeowners that install a tankless gas water heater may qualify for up to $300 in tax incentives. There are a number of tankless water heaters on the market, and deciding which one is right for your application can be tough. We’ve made it a little easier for you by doing all of the research and coming up with the five best natural gas tankless water heaters available. We looked at all the details, both good and bad, and compiled them into a guide that will help you decide what unit is worth your investment. 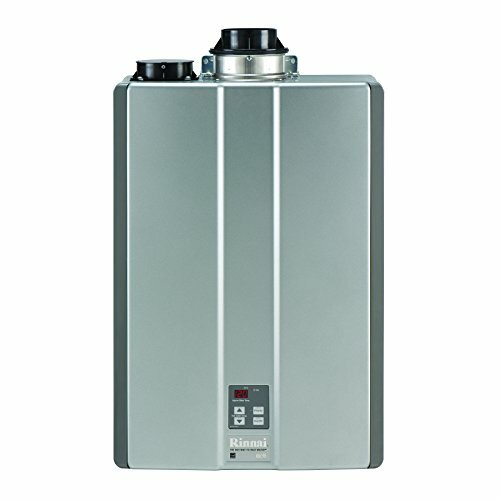 If you are looking for the overall Best Tankless Water Heaters. If you’ve got a larger family that has a high demand for hot water, this could be the water heater for you. Not only is this a tankless water heater, it also runs on natural gas, which is generally cheaper than electricity. It’s packed with advanced technology that makes it ultra-efficient, meaning no wasted energy, and you get hot water instantly and consistently. It’s a bit of an investment at $1,540 plus materials necessary for installation, but it is a project just about anyone who’s handy can tackle. This unit won’t have a hard time keeping up with a busy household’s hot water demands. Outputting 9.8 gallons per minute, it can handle multiple uses at the same time without running out. Several loads of laundry won’t even phase it, and running the dishwasher while someone showers won’t drop the temperature. In fact, it can be set to heat water from 98° F to 140° F range. It’s also an attractive unit that is extremely compact, only measuring 18.5″x 26″x 10″, substantially smaller than a tank. This is an extremely efficient water heater, that’s earned the Energy Star certification, which is good news for your energy bills. When compared with similar models that cost up to $494 in energy, this unit only uses $417. Keep in mind that’s an average and your actual savings may be higher, or lower, depending on the energy costs in your area. Still, it’s not hard to see how it pays for itself over time. One of the biggest drawbacks of this tankless water heater is its price, plus professional installation. Some reviewers have noted that local companies wanted between $3,000 and $4,000, however, it can cost upwards of $1,500 to do it yourself. While it certainly will return the investment over time, it may be a bit too much for some homeowner’s budgets for a retrofit. The unit can use either a concentric or PVC vent, whichever the installer prefers, or has to use because of local codes. However, there are several reviewers that have encountered unexpected expenses when using the concentric exhaust because it requires additional OEM parts. If you don’t have the parts on hand to finish the installation, you’re not going to have hot water until you can get one shipped to you. There is no denying that this is one of the best natural gas tankless water heaters that you can buy. If you can do the installation yourself, you can reasonably expect it to cost $3,000. Since it’s Energy Star certified, however, you may qualify for a tax benefit of $300. And, it will keep returning by reducing your energy consumption for hot water heating, so you’ll see savings on your gas bill into the future. 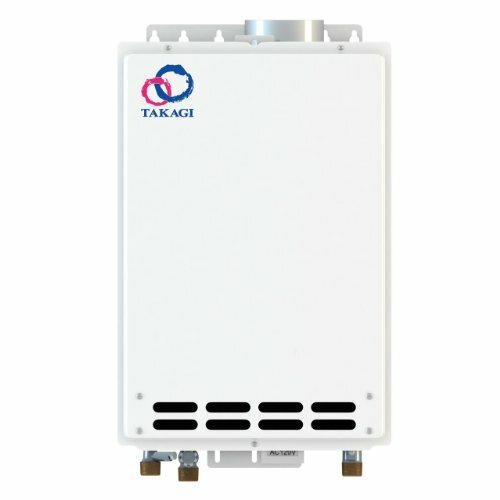 Perfect for smaller homes, apartments and light hot water demand situations, this is the smallest tankless water heater that Takagi makes. Don’t let that give you a negative impression, this little unit is powerful enough to supply unlimited hot water for a family of three to five, with no trouble. It’s priced reasonably, at around $520 with free shipping so it’s an inexpensive DIY home improvement project as well. Customers that have installed this say that they use it without fail running up to three loads of clothes and using the dishwasher every meal. Not only that, but they find that four or five adults can shower without running out of hot water, even with all the other use. It outputs up to 6.6 gallons (GPM) of hot water per minute. That’s not bad for a unit measuring only 6.7″ x 13.8″ x 20.3″. Environmentally friendly because of its energy efficiency, this tankless water heater has earned the Energy Star rating. It has an estimated annual energy cost of less than $200, depending upon the energy costs in the area it’s installed. Plus, it is covered by a ten year heater exchange warranty and the parts are covered for five years, so it is made to last. Although the installation can easily be accomplished by a handy homeowner, doing so will invalidate the warranty. In fact, installation must be done by a Takagi Certified Technician to get any warranty. Hiring installation out can easily double the cost, bringing it closer to $1,200 without any additional parts or alterations. Most DIYers find that the additional costs aren’t worth it and forgo the warranty. If you have hard water, there is a good chance that minerals and other materials will build up in the heat exchange over time. If you’ve got a water hardness rating of 7, or higher, it’s necessary to install a scale inhibitor to catch particles. Venting can be an issue as it cannot share a vent stack with anything else. It actually needs to be vented horizontally, meaning holes will need to be drilled to allow for the vent. If you’re switching from a conventional natural gas water heater, you’ll see a huge change in the amount of hot water you get, all the time. Because it’s so energy efficient, the cost to heat your water will drop to $200 or less for the entire year. You can install this yourself, but read the manual first to make sure you have all the necessary parts and tools. Keep in mind that the warranty is only valid if the unit is installed by a pro, which could double the cost. Most don’t bother with it, though, and still love the unit. This tankless hot water heater was designed to be installed outdoors, which makes it ideal for tiny homes and other houses where space is limited inside. It will also accommodate the needs of a small family with multiple hot water needs. Because it operates on natural gas, it’s naturally more efficient and less expensive to operate than an electric water heater. It’s moderately priced at around $920, so it isn’t an unreasonably large investment when it’s installed by the homeowner. It’s designed to be installed outside, rather than under a sink, or in the basement. That means it doesn’t require any venting, which means there are no extra parts to buy. Being outdoors also makes it safer as there is no chance of any gas buildup inside the home. Because of its diminutive size, only 8.5″ x 13.8″ x 20.3″, it doesn’t take away from the home’s exterior, but rather blends in. The best part about this tankless water heater is its output. It can deliver up to 8 gallons a minute, which is plenty of hot water to do a load of laundry, take a shower, run the dishwasher and use the sink. It’s got, outlet thermistors that monitor the temperature constantly, ensuring a constant supply. Plus, it has freeze protection technology that will kick in when the outdoor temperature drops. 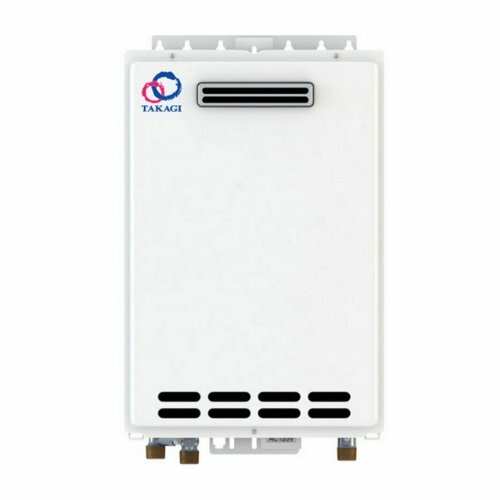 Like all Takagi water heaters, it comes with 5 year warranty on the heat exchanger, 3 year warranty on parts and 1 year warranty on labor. However, it must be installed by someone who is certified through the company. installing the unit yourself will cause the warranty to be invalid. That said, professional installation is costly, and Takagi only licenses a few individuals, so it may be difficult to find one. Another potential issue is that it has an electric ignition. If your electricity goes down, you won’t get any hot water until the power is restored. The only way to overcome this problem is to have a backup system in place that will take over. If you live in an area that is prone to power outages due to storms and other problems, this may not be the best choice for you. Generally, this is a non-issue in most areas. This is a great tankless water heater for its price, and it’s not terribly difficult to install yourself. For an average small family, it will produce endless hot water for showers, laundry and other household needs. As long as you understand that self-installation voids the warranty, it’s a straightforward installation that should only take a day or so to finish. You’ll also notice a nice drop in your gas water heating bills, and it is Energy Star certified, so it also may qualify you for a break in your taxes. 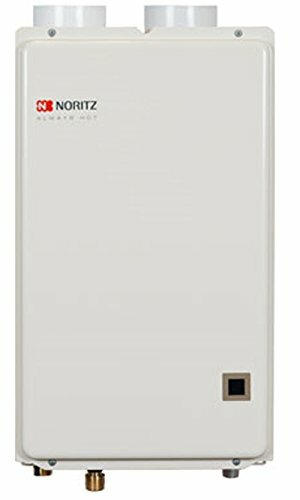 When it comes to high-quality water heaters, Noritz has been leading the industry for more than six decades. This condensing direct tankless water heater, powered by natural gas, is one of the most advanced yet. It will provide more than enough hot water for a typical two bathroom home in the south, or a bath and a half in the north. It’s less than $950, measures only 6.7″ x 13.8″ x 23.6″ and makes for an easy DIY home improvement project. It has a maximum output of 6.6 gallons per minute of endless hot water. Reviewers say that they have enough hot water for multiple simultaneous showers, or a washing machine and shower at the same time. Because it’s so energy efficient, it has been granted the Energy Star certification, which also means it will help reduce your energy use and lower your monthly bill. The best thing about this is that it can easily be installed by anyone with handyman skills. The instructions are clear and detailed and the installation is very simple. Plus, this unit doesn’t require a high-temperature vent, which can be difficult to find. It can be installed with Schedule 40 PVC pipe and fittings, which should be readily available at any big box home improvement store. It comes with an excellent 12 year warranty on the heat exchanger and 5 years on parts, plus 1 year of labor. Bear in mind that improper installation invalidates most warranties, and this one is no different. If you’re concerned with protecting your investment, be sure you’re able to handle the job. If you’re not completely confident in your skills, hire a professional so you know your warranty is valid. It’s actually quite difficult to find anything negative about this water heater, based on all of the reviews we’ve seen. That said, the only con for some was the price, versus that of a conventional tank gas water heater. Price shouldn’t be the most important factor when you’re shopping for a new tankless water heater, but it is a factor. While this isn’t the most expensive water heater on this list, it certainly isn’t cheap, but it’s an investment that will be returned over time, so it’s really a personal choice. This is a good choice for the average household with two or three bathrooms, laundry facilities, and a dishwasher. Customers love the fact that it can handle multiple uses without losing water temperature for long periods. If you’ve got some basic plumbing and gas line installation knowledge, you’ve got the skills you need to install this yourself. Don’t let the price scare you away, it’s a great value for the money. When it comes to trusted brands, Rheem has got to be one of the most recognized in the industry. It’s not wonder this tankless water heater made our top best five list then. People who have installed one of these in their home say it provides them with truly endless hot water, even with heavy use. It’s a $1,200 investment, but it more than makes up for it in convenience and energy savings over time. This is a powerful tankless water heater, capable of delivering an astonishing 9.4 gallons a minute under optimal conditions. One reviewer says that right after they installed theirs, the entire family took showers and even ran the washing machine while a shower was going. They didn’t experience any temperature fluctuations, just a slight drop in water pressure. That’s what you call endless hot water. Like most natural gas tankless water heaters, this one is a fraction of the size of a standard water heater tank, measuring only 18.5″ x 9.8″ x 27.5″. It’s still compact enough to be put inside a closet, or in a corner without being too obtrusive, yet it has no problem servicing the entire household. Plus, it has a modern, clean design that easily blends into any home style. One of the only real issues that people note about this specific tankless water heater is that it has a very low kick on rate, meaning it instantly starts heating. If you’re using a single handle faucet, you have to make sure it’s turned completely to cold, or you’ll get hot water every time. That’s not a big deal, unless there are small children around and the hot water temperature is set high enough to scald them. Perhaps the only other downside is that you really have to learn how to use your hot water differently. While you may be used to adding cold water when you’re showering to moderate the temperature, that’s not how it works with a tankless heater. The temperature you set the water at will be constant, meaning you can just turn it on and enjoy a perfectly hot shower without adjusting it every few minutes. We will keep this short. 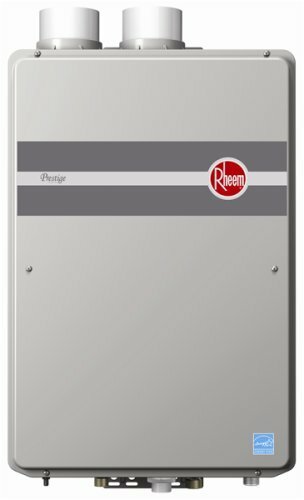 If you are looking for a natural gas tankless water heater from Rheem, this is the one to get. Period. You really can’t beat Rheem’s reputation for quality products and for their outstanding warranty. It’s a hefty investment, but remember that a tankless water heater can last 20-30 years. The energy that you save on water heating will continue every month for years to come. What’s really important, though is that it will provide you with endless hot water, whenever you need it, without emptying your wallet. Installing a natural gas tankless water heater is an easy choice for any homeowner that is concerned with lowering their energy consumption. The ones we’ve listed here are all Energy Star certified, highly efficient, dependable and consistently provide hot water to families all over the country. Because they’re so efficient, installing one of them will qualify you for a tax incentive, and maybe even a rebate from your local utility.